Jim Rider currently serves as the Vice President, bringing over 12 years of experience to the CCR Board. He has served as a high level volunteer in several capacities including participant, mentor, captain and coach. He also has over 5 years of experience in the non-profit sector for two large national organizations. Jim currently works in the biotechnology field supporting cancer research. He also enjoys running and has participated in 14 Marathons and over 45 Half Marathons since starting running in 2003. Dr. Chad Wells is the owner and founder of The League Sports Rehab and is an industry leader in sports injury treatment and rehabilitation. Dr. Wells has also taken his specialized work on the road as a USA Team Doctor for the 2008 Summers Games in Beijing, 2008 Olympic Trials, and 2008 World Cups, as well as serving as Team Doctor for the San Diego Siege of the NWBL and the San Diego Thunder of the SWFL. Samantha Greasley is Senior Principal Scientist at Pfizer, with 20 years of experience as a protein crystallographer after gaining her PhD from University of Leeds, UK. And over 15 years of experience in pharmaceutical industry R&D, with a primary focus in the last 10+ years in oncology drug discovery. She's also an avid runner, finishing 16 marathons, including the Boston Marathon, twice. She's been coaching charity run teams since 2011 and has been a participant in fundraising programs since 2006. Most importantly, Sam is a mother of twin girls. Cheryl Sheremeta is a Founder and Head Run Coach of Cheetah Charity Runners along with husband James Sheremeta. Cheryl is a former elite runner and professional triathlete with over 20 years of coaching experience. Cheryl has coached thousands of runners for charity training teams and has helped raise millions of dollars though these programs. Cheryl brings her personal experience as an elite athlete and respected coach to support The Emilio Nares Foundation and help underprivileged families with children battling cancer. James Sheremeta is one of San Diego’s top elite distance runners. James has over 25 years of individual, group and charity team coaching experience. 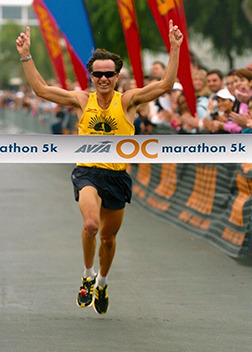 James is a sponsored national class masters distance runner and has won countless races ranging from the mile all the way up to the Marathon in almost three decades of competition. James is proud to be a Cheetah Charity Runners head coach with his wife Cheryl Sheremeta and looks forward to growing the CCR run team and fundraising support for the Emilio Nares Foundation with his highly dynamic, experienced and motivational coaching style. Karen Shabel currently serves as the Campaign Manager for the Cheetah Charity Runners. She is active in the San Diego philanthropy community and has over 8 years of fundraising experience with local endurance training charities, helping multiple organizations reach their fundraising goals. Karen loves a challenge and has run 20 half marathons since 2009, including 3 with the Cheetahs in addition to other endurance events. Dave Marinkovich is Support Manager at Electronics For Imaging, a Fortune 500 Company, with 28 years of service to the company. Dave graduated from UCSD after studying Math, Computer Science and Psychology. He has been active in the local philanthropy community for more than ten years. He's been an avid runner for the last 30 years completing countless distance events. He has been coaching charity run teams since 2008 and helping to support cancer victims has become his passion. Marianne is the owner/administrator of McLean Construction which has specialized in custom and speculative building of family homes for 35 years. A survivor of early stage breast cancer in 2011, Marianne decided to take up running the following year because she could! Since then, she has participated in numerous races of all distances. Along with her husband, they have always supported many charitable causes, including building homes for the under privileged in Mexico. This will be her first opportunity to serve on a charity board and is looking forward to the challenge.